The Patriarch of Western monasticism was born in Nursia, in central Italy, about 480. In his youth, seeing the corruption of the world, he left home to live a hermit's life of penance and prayer in a cave in the mountain of Subiaco, near Rome, where he was instructed in Christian asceticism by Saint Romanus, a Solitary of the vicinity. His reputation for sanctity gathered a large number of disciples around him, for whom he erected monasteries in which they lived a community life under a prescribed rule. In the year 529, he left Subiaco for Monte Cassino, and there founded the great Abbey which became the center of religious life in Europe. The principles of the rule written by Saint Benedict became the basis of religious orders and congregations after his time. It shows the way to religious perfection by the practice of self-conquest, mortification, humility, obedience, prayer, silence, retirement, and detachment from the worlds and its cares. 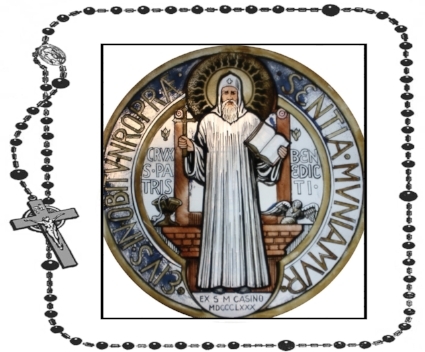 Saint Scholastica, the (twin) sister of Saint Benedict, was the first Benedictine nun. She presided over a monastery of nuns near Monte Cassino. Saint Benedict died March 21, 543, as he stood before the altar of Monte Cassino immediately after receiving Holy Communion. Prayer: God, You established Saint Benedict the Abbot as an admirable teacher in the school of Devine servitude. Teach us never to prefer anything to Your love and always to run the way of Your Commandments with most generous dispositions. Amen.